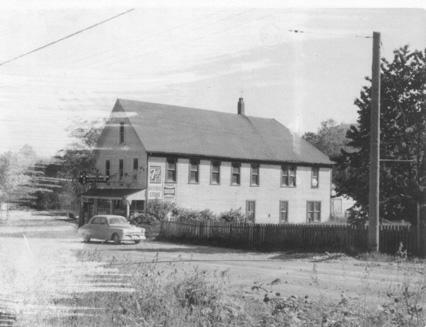 The main structure of the Brackendale Store was built in 1916 by Hughie Mills to replace John Jackson's old store which burnt down the year before when a fire started in the upstairs pool hall. The site was originally bought from the Judd family as Lot 6 of their subdivision. During the new store's first year, the upstairs served as a temporary home to the Judd family after their own house burnt down. Although the appearance of the original store is difficult to see in the store's present form, the basic structure is still apparent when viewed from the back. Regardless of any alterations which have occurred, the Brackendale Store retains heritage value tot he community as a long standing local landmark which has continuously provided service to the community since its early days. Original use: Store, post office. Current: Store, post office, restaurant. Current condition: The store has been seriously altered from its original form.